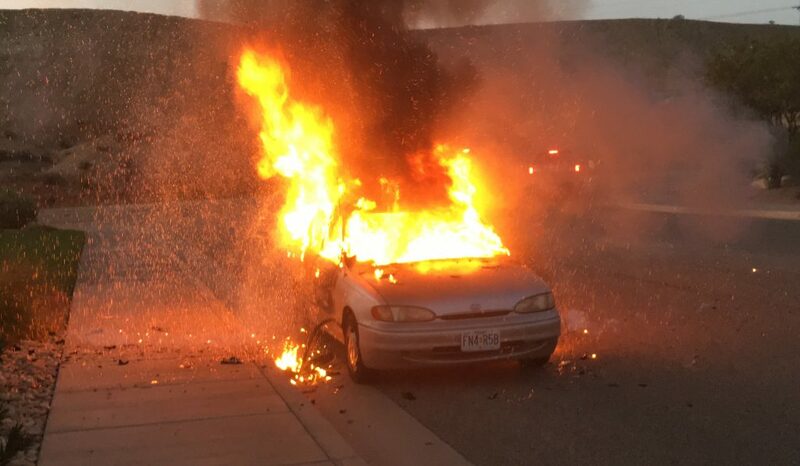 ST. GEORGE — A car exploded with raging flames and sparks in St. George Thursday after a group of bystanders watched two people running away from the scene. 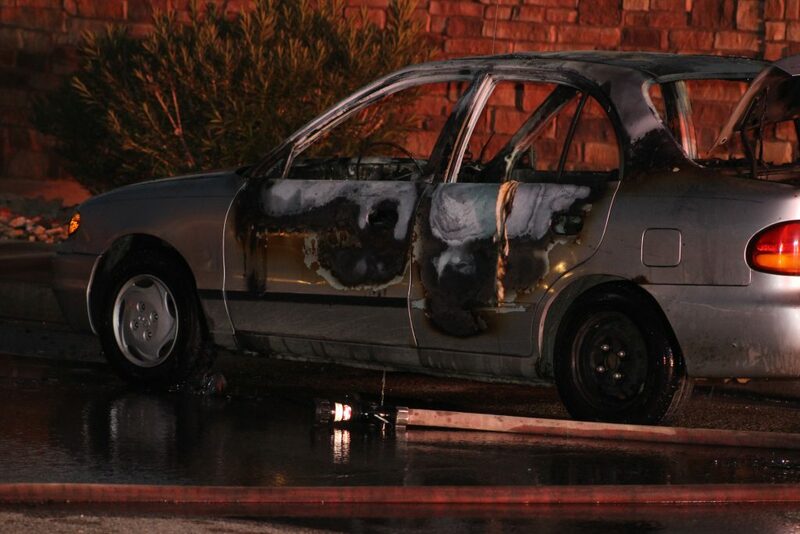 The car burst into flames on Barcelona Drive near the intersection of Hidden Valley Drive at about 6:50 p.m. 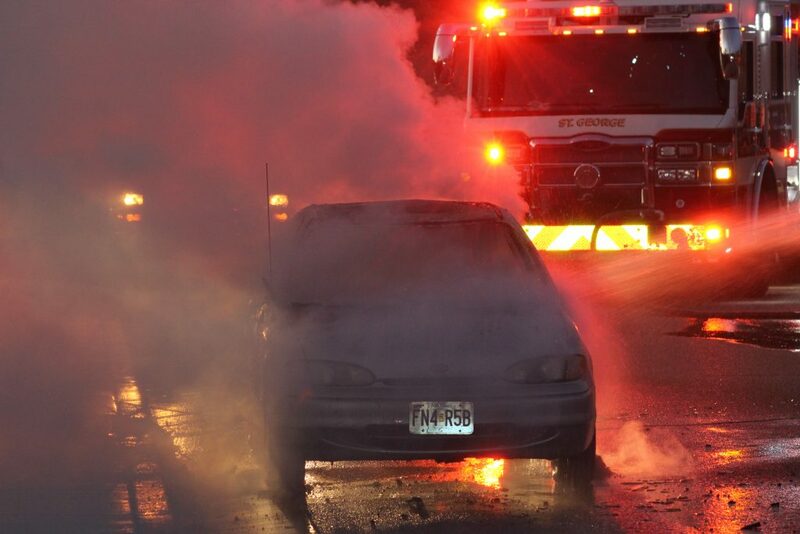 The smell of burning rubber filled the air as black smoke billowed from the vehicle. As the fire was raging, the sound of the car horn was blaring. 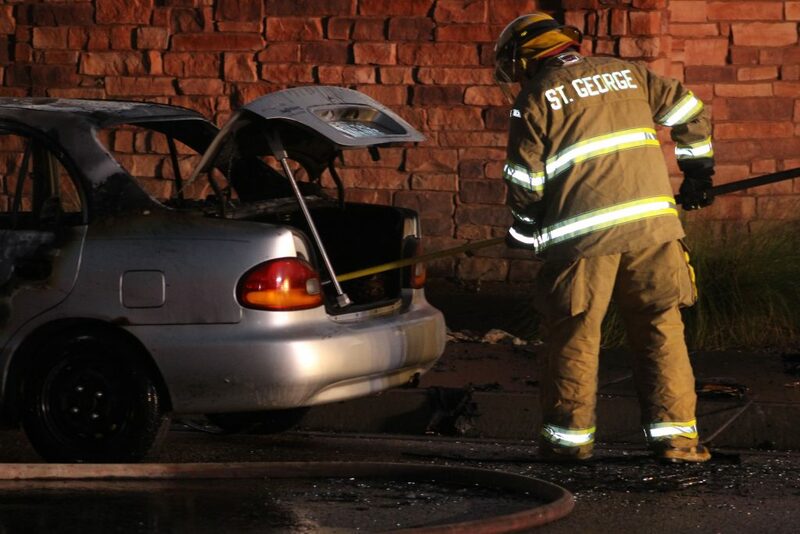 Small explosions sent debris flying as the St. George Fire Department arrived on the scene. No injuries were reported and no surrounding homes were affected by the fire, Hooper said. The cause to the fire is not known to responders at this point, he said. 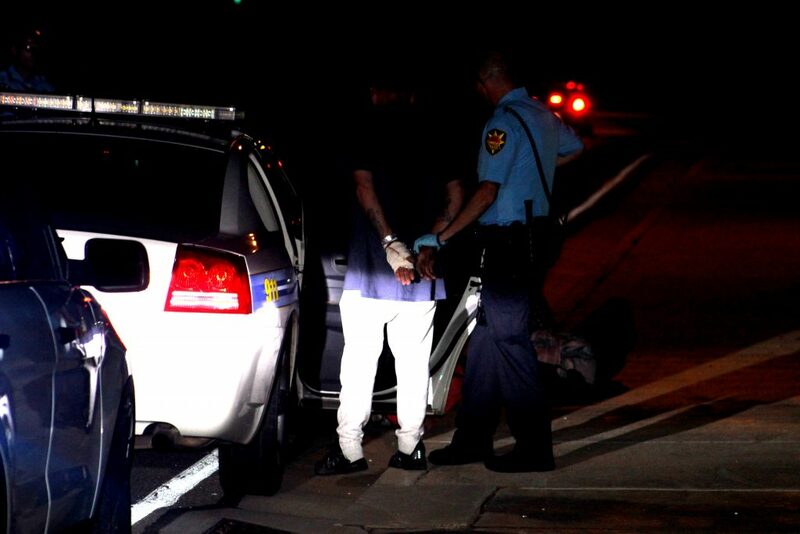 The occupants of the vehicle ran away from the scene and were apprehended by officers from the St. George Police Department about one block away from the fire on Hidden Valley Drive. 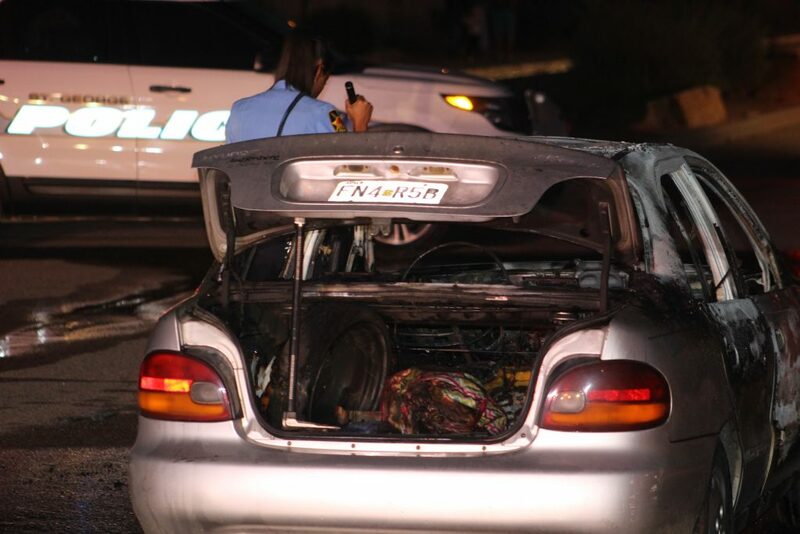 A group of youths riding their bikes around the scene at the time told St. George News they saw a man and a woman running away from the car after putting a gas canister inside the cab of the vehicle. 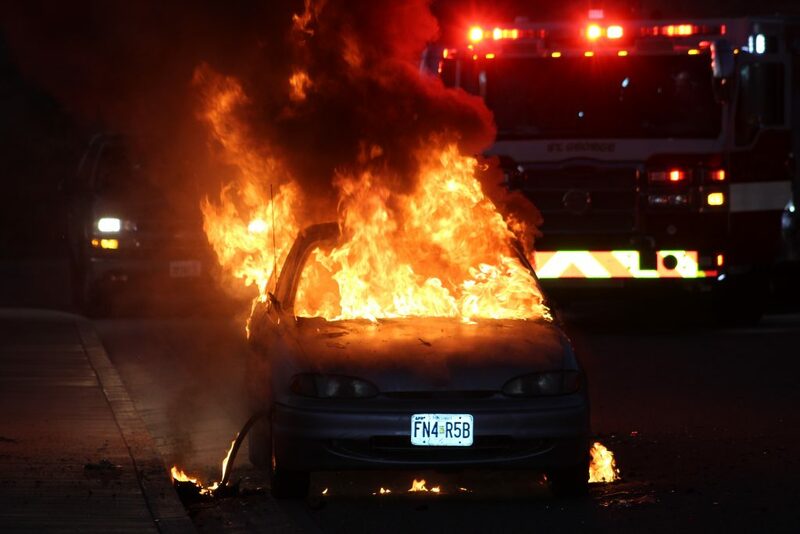 Cameron Woolley was on her way home when she saw the fire starting in the car as well. She said she saw the fire starting in the trunk of the vehicle and she also saw the gas canister above the center console in the car. St. George Police Officers weren’t available to comment on what caused the fire, why the occupants ran away and why they were arrested. This is a developing story. 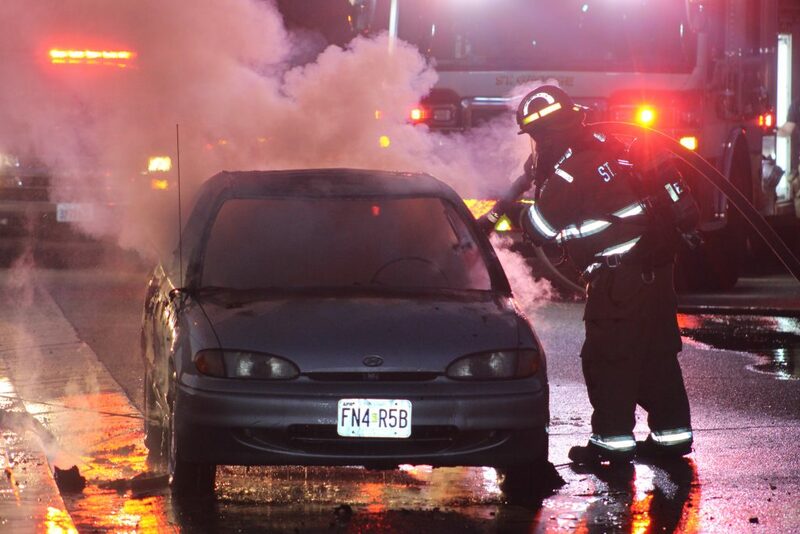 First, stolen car… Arson… for starters. Who are these jokers and from which State did they crawl out from? Little St. Geezy ain’t so little anymore. 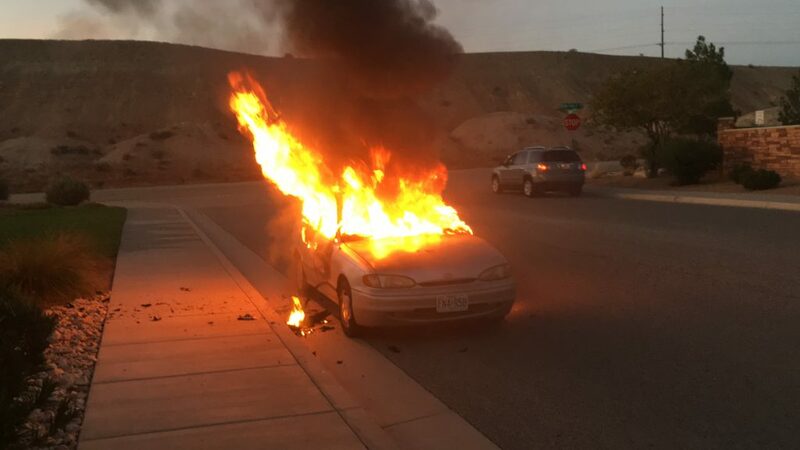 Hopefully just lowlife passing through (on the way to California), maybe the car broke down and they thought the fire wouldn’t attract attention as they destroyed the “evidence”. OMG, telling a kid to F- off?! I’m glad your car burned up, you big jerk! Every now and then, a comment comes through that incites a good chuckle from the editorial board. We don’t often acknowledge them, but hey, it’s Friday. And this was funny on many levels. 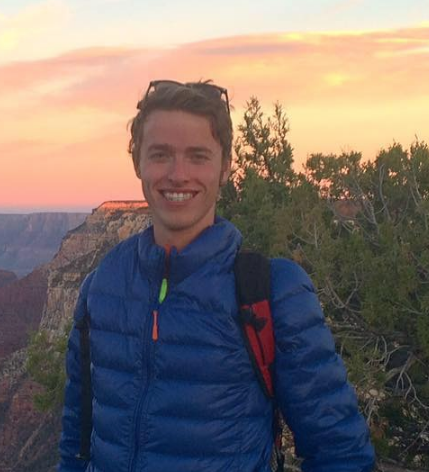 Thanks for being an (obviously) active part of St. George News. Carpr Diem, you have been knighted. That seventh grader is more advanced than I was at his age. I didn’t know what weed smelled like until I got to college.